Export Outlook to Notes Smartly With SysTools! To export Outlook to Lotus Notes email data, you have to export PST to NSF because Outlook stores all its information in PST files and Lotus Notes stores the email data in NSF files. Congratulations! You have just spotted a smart PST to NSF tool to export Outlook to Notes email data. Welcome to smart way of converting PST to NSF using SysTools Outlook to Notes software, which will help you to convert PST to NSF in such manner that besides getting successful results, you will also love the way our product's interface talks to your through the successive screen instructions. Also, while using SysTools Outlook to Notes software, you will see the easiness channelizing through the smart process to export Outlook to Notes. You will witness and non-problematic conversion and our software expertise will speak for itself! In case you face any difficulty in using SysTools Export Outlook to Notes services , you can contact our support section, which has extensive knowledge regarding software. Our support section is available 24X7 to guide you and assist you. You can clear all your doubts here. Exports PST file's email items to NSF file format. Export PST items to new or existing NSF file. Embedded with powerful email conversion algorithm. Converts unlimited Outlook PST files to NSF. Supports both ANSI and Unicode character conversion. Free to download evaluation version available. Conversion of Outlook Calendars to Lotus Notes. Convert Outlook Emails to Lotus Notes emails with all email meta data intact such as email properties (to, cc, bcc, attachments, sent & received dates), email folders (Inbox, Sent Items, Drafts, Deleted Items, Outbox). Software support converison of groups/Outlook distribution list to Lotus Notes Groups. Supports every version of Lotus Notes - 8.0, 7.0, and 6.5, MS Outlook - 97, 98, 2000, 2003, 2007, and 2010 on Windows platform (Window 98/2000/2003/XP/Vista/7). Get Full Version – To Export Unlimited Outlook files to Notes! Purchase the full version of Export PST to NSF software to perform flawless PST to NSF migration. As soon as you purchase the full version of Export PST to NSF software, you are entitled to get lifetime product support. FREE Demo – Why Don't You First Try The Tool? Why don't you first try SysTools Outlook to Notes software using its FREE Demo Version? This will give you a fair idea about our software, its functioning, its features and the process of converting PST to NSF . You can Download this trial version of the software absolutely free of cost. 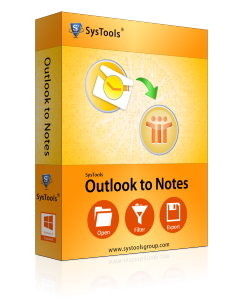 The FREE Demo Version of SysTools Outlook to Notes software will help you evaluate the performance of our tool. If you find it worthwhile, you can then buy the full working version of our software for recovering your email data.